During the early hours of Saturday 28 May 2016, Jordan Ash (25) was woken by his dog, Diesel, who had been sleeping at the foot of his bed. Diesel – who was rescued by the Ash family after being abandoned when just months old – was barking, scratching and pulling at the duvet, desperate to wake his owner. Jordan immediately knew something was seriously wrong, as Diesel’s behaviour was so out of character. He is usually very calm and relaxed, rarely barking. Jordan got up to take him downstairs but, on opening his bedroom door, he was met with a wall of flames only six feet away. He raced to wake up his parents, Chris (50) and Tina (54), shutting Diesel in his room to keep him safe. Unable to use the stairs due to the fire, Jordan helped them escape through a small bedroom window over the kitchen roof. Once they were safe he went back to collect Diesel. At this point he was almost overcome with the smoke and acrid fumes but managed to reach him. He passed Diesel through the open window to his dad and they all climbed down to safety. The family later discovered that the fire had been caused when their fridge freezer, located under the stairs, caught alight. It caused 60% fire damage and 90% smoke damage to their home. They weren’t able to move back in for ten months. Their smoke alarm had been temporary removed while they decorated. Police Dog Ozzy received the PDSA Gold Medal for his bravery and life-saving actions disarming an armed assailant threatening to blow up a block of flats. Before his retirement, nine-year-old PD Ozzy worked for Police Scotland. 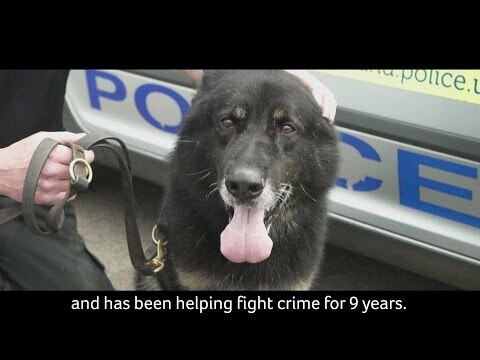 In 2015, Ozzy and his handler, Police Constable Brian Tennant, were called to an incident at a flat in Falkirk, where a man had assaulted two people at knifepoint. On arrival, they discovered the man had severed a gas pipe and was threatening to blow up the building. The occupants of the flats were evacuated, leaving PC Tennant and PD Ozzy able to enter the building. The armed assailant charged at them, shouting threats, while attempting to ignite the gas with a lighter. After warning the assailant, PC Tennant released Ozzy, who tackled the man to the ground, where he was disarmed and arrested. PD Ozzy’s intervention prevented the man from harming himself, potentially others and causing extensive damage to the building. K9 Killer and his handler Field Ranger Sergeant Amos Mzimba of the Special Operations Team, based in the Shangoni section of Kruger National Park, have worked tirelessly over the last five years in the fight against rhino poaching in Africa. Several dogs have contributed extensively to the tracking and apprehension of rhino poachers, but Killer is seen as the most successful dog. As at 23 July 2015, he has been responsible for 77 arrests in the last four years and the recovery of arms, ammunition and many rhino horns. The dogs and handlers are under constant threat from larger game and poachers carrying heavy calibre rifles and automatic weapons. On several occasions, K9 Killer gave his handler an early warning of poachers in the vicinity. He’s saved human life while working to prevent the very imminent threat of extinction to the rhino population. An example of K9 Killer’s tracking ability comes from 16 July 2013 when he worked in conjunction with the Field Rangers. The Special Operations team were called into action following a reported sighting of three suspected poachers near the South African National Defence Force base in Houtbosrandt. K9 Killer and his handler were part of a follow up operation and flown into the area by helicopter. K9 Killer responded positively to the scent and began tracking the suspects. After about one kilometre of tracking, the dog indicated that the suspects were close by. One suspect fired at a member of the Special Operations Team who then returned fire leading to the suspect being killed. A hunting rifle, ammunition and other poaching equipment was recovered at the scene. K9 Killer’s tracking ability led to a second suspect being arrested. A third suspect fled the scene and managed to escape. Several other incidents have been recorded in his handler’s diary, giving details where K9 Killer has successfully tracked poachers. K9 Killer continues to thwart illegal poaching and his devotion to duty has helped to save the lives of countless endangered rhinos. On 13 July 2010, police dog Gage and his handler Senior Constable Bruce Lamb were called to an address in a Christchurch suburb, New Zealand, as backup for what was initially thought to be a routine drugs search. As Gage and Senior Constable Lamb entered a bedroom at the address, they were confronted by the suspect, who was armed with a rifle. They were shot at and the bullet hit Senior Constable Lamb in the face. The force of the shot broke his jaw in 15 places and forced him to the ground. The offender tried to shoot him a second time but, as he took aim, Gage leapt over his handler and instead received the shot. This bullet would undoubtedly have killed Senior Constable Lamb had Gage not jumped in the way. Senior Constable Lamb and Gage escaped from the house but, tragically, Gage died of his injuries before they were able to seek any veterinary assistance. A second police officer, Constable Mitch Alatalo, was also shot and injured. Other officers at the scene believe that Gage’s actions gave them the vital seconds needed to escape or ready themselves against the offender. Gage was a strong-willed and courageous dog that made the ultimate sacrifice to protect his handler and his colleagues. Ten-year-old explosives search dog Ajax was awarded the PDSA Gold Medal at a special ceremony in Madrid in June 2013. Ajax is credited with saving many lives after detecting a hidden ETA bomb on the island of Majorca in 2009. Just hours earlier, a terrorist explosion had claimed the lives of two Civil Guard personnel. Suspecting further attacks, Sergeant Alabarces Muñoz and other Civil Guards were assigned to help in the search and were sent to the Civil Guard barracks in Palma Nova. Ajax soon found a concealed bomb that had been carefully attached to the underside of a vehicle near the barracks. The area was evacuated and a controlled explosion of the bomb was carried out successfully. The shrapnel scattered over an area of 100 metres. Ajax passed away in August 2013, weeks after receiving his PDSA Gold Medal. Faithful family dogs Ellie and Jones have become the 20th and 21st recipients of the PDSA Gold Medal – recognised as the animals’ George Cross – in recognition of their life-saving actions when their owner became ill.
Their amazing story began in November 2010 as their owner, Les Parsons, who has (Type 1) diabetes, took the two dogs for an evening walk in remote country lanes near their home. Les’s blood glucose levels suddenly dropped and he went into what is known as a ‘hypo’, due to his condition. The situation was made worse as he was not carrying any sweets to remedy the condition, or a mobile phone to summon help. Increasingly desperate, Les tried to get home via a short cut but his blood glucose levels fell lower. He attempted to crawl home but began drifting in and out of consciousness. Ellie and Jones tried to encourage their master by licking, nudging and pawing at him, but Les was unable to continue. One-year-old Ellie remained at Les’s side while two-year-old Jones ran home to alert Les’s wife Joanne and daughter Fiona. When they realised something was wrong, he led them back to where Les had collapsed. An ambulance was called and Les was rushed to hospital, in a diabetic coma and suffering from hypothermia. Thankfully, he was allowed home after treatment, having suffered no lasting damage. Commenting on the award, PDSA Director General Jan McLoughlin said: “This is a remarkable case in which two family pets faced an extraordinary situation. With no training to help them, it appears they acted as a team to save their master. One dog ran home to fetch help, while the other stayed with the owner. Anya was a newly qualified Police Dog in January 2008, when she and handler PC Neil Sampson were among a group of police officers called to attend a flat where there were reports of a man armed with a knife. Though fully trained, she had not yet experienced a violent encounter for real. PC Sampson and Anya were watching the entrance to the flats when a man emerged and walked towards them, drew a knife and began swiping it back and forth at PC Sampson. Anya leapt into action immediately, confronting the assailant head on. She tackled him fearlessly, as he lunged and slashed at both officer and dog. During the frenzied attack PC Sampson received seven stab wounds; four to the back of his head, one through his lip and two in his right leg. His stab vest also took a number of strikes. Within moments other officers intervened. They deployed batons and a taser gun before the violence subsided and the assailant was disarmed. PC Sampson was face down on the ground with severe injuries – but still alive. Anya was also stabbed and suffered a chest wound, requiring veterinary care. During this horrific attack, PC Sampson and his fellow officers faced extreme danger. Had it not been for Anya’s dedication to her duty and unstinting devotion to her handler, both the severity and number of injuries sustained would undoubtedly have been greater. In the early hours of Friday 30 May 2008, Jenny Barwise, her parents and fiancé were all asleep at the family home in Cumbria when a fire broke out in the kitchen. An electrical fault was believed to be the cause. Frodo, Jenny’s three-year-old Beagle, was the first to sense danger. He raised the alarm by barking incessantly until she woke Jenny’s father David, who went downstairs and saw flames coming from the kitchen. David raced to wake his wife Annette, before going to alert their daughter Jenny. Frodo was ahead of them and was barking and scratching at Jenny’s bedroom door. Amid the smoke and chaos, Frodo jumped on Jenny’s bed to show her father where she was. Still barking to raise the alarm, Frodo then raced towards the flames and into the living room, where Jenny’s fiancé Liam had been sleeping. He managed to escape but required hospital treatment for of smoke inhalation. Only once everyone was safely outdoors did Frodo’s frantic rescue mission end. It took three fire crews two hours to put out the blaze. The ceiling had collapsed in the living room where Liam had been sleeping and the kitchen roof was completely eaten away by the force of the fire. The Fire Service confirmed that, had it not been for Frodo’s actions on the night of the fire, lives could have been lost. On Wednesday 18 June 2008, Patricia Adshead was at home in southeast London with her daughter and former husband, Frank. At around 11pm, three masked intruders burst through the front door: two were wielding machetes, the other a dagger. They immediately confronted Patricia, who was alone in the front room. Alerted by her screams, Frank rushed downstairs where one of the gang lashed out with a machete, slicing through his hand. Realising their burglary was not going according to plan, two of the intruders ran out leaving the third in the front room with Patricia, who was now joined by the family dog, Oi. Realising the door was jammed and he was trapped, the assailant raised his machete as if to strike Patricia. At this point Oi jumped up to protect her owner, biting the man’s hand. In retaliation the intruder brought the machete down twice onto Oi’s head. As he made his getaway, Oi gave chase, making sure he no longer posed a danger to the family. Oi was rushed to Thamesmead PDSA Pet Hospital, The Freda Powell Centre, where she required emergency surgery. Despite her serious condition Oi showed no aggression towards PDSA veterinary staff. They noted that this brave dog remained bright and alert throughout her ordeal. 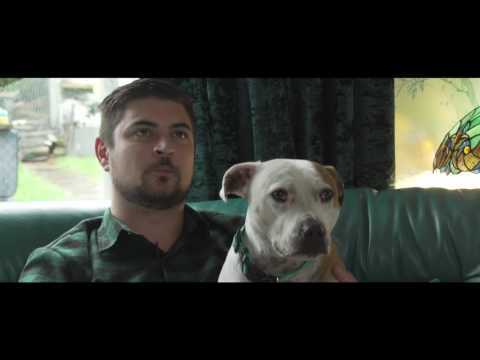 On Sunday 29 April 2007, George, a 14 year-old Jack Russell terrier from Manaia, New Zealand, was walking with his neighbour’s children when they were approached from behind by two Pit Bull Terriers. The dogs were loose and moving quickly towards one of the younger children. George, who had been walking ahead of the group, turned around and faced the Pit Bulls. The brave little Terrier ran at the dogs, barking all the time as they closed in on him. Thanks to George’s intervention the children were able to escape but they could do nothing to help the dog that had saved them. Reluctantly, due to the trauma George had suffered, George’s owner, Alan Gay, agreed to have George put to sleep. George’s bravery in the face of danger and his determination to protect the safety of his young friends prevented serious injury and potentially saved the lives of all five children. The PDSA Gold Medal was awarded posthumously to George on 11 February 2009. Hundreds of people from the beloved pet’s home town turned out to remember George’s heroism alongside the brave dog’s owner, widower Alan Gay, as he proudly accepted the award from Governor-General His Excellency The Honourable Anand Satyanand presenting on behalf of PDSA. The five children George protected in the savage attack stood proudly alongside Mr Gay and the bronze statue of George which had been erected by the town in honour of their hero dog. On Saturday 12 August 2006, 73 year-old Mark Corrie took his daughter’s dog, Bosnich (Bos), for their regular walk in Gelt Woods near Brampton in Cumbria. But when he failed to return by the expected time, Mark’s daughter, Lorna Farish, called the police. For two days police search dogs and volunteers from mountain rescue teams scoured the district for man and dog, but without success. Local walkers Susan and Jim Burns and Sheila and Fred Brown decided to investigate a dog howling on the south side of Cumrew Fell, some seven miles from Brampton. At the top of the first ridge, they spotted Bos whose howl changed to a persistent bark. Bos led them to where Mark Corrie was lying. He was cold, confused and suffering from dehydration, but miraculously unhurt. Bos stayed at Mark Corrie’s side as they waited for the emergency services. Penrith Mountain Rescue Team praised Bos for his actions and said that without the dog keeping the pensioner warm and his determined howling and barking Mark Corrie might not have been found. On the morning of Monday 19 December, devoted pet dog Ghillie was enjoying a morning stroll on the local bridle path with his owner’s mother, Mary Wilson, when Mrs Wilson suddenly collapsed. Seeing her lying unconscious, Ghillie wasted no time in running for help. His constant barking attracted the attention of a team of engineers from Scottish and Southern Energy, who realised the dog was determined to show them something. Following Ghillie along the path the men discovered Mary lying unconscious, but breathing, next to a ditch. Mary was carefully transferred to Balfour Hospital where, happily, she made a full recovery. Ghillie’s determination to gain help for Mary after her fall secured her rescue and undoubtedly saved her life. Vinnie and his handler, PC Dave Coleman, were already on duty in the City when they were urgently deployed to the terrorist explosion at Russell Square tube station. Vinnie immediately began a search for secondary explosive devices in order to establish a clear and safe route for medical assistance to reach the many casualties. Overcoming choking smoke and poor visibility, Vinnie then searched the mile-long route from Russell Square to the bomb-damaged train at Kings Cross and completed a reoccupation search of Kings Cross station. Despite the horrendous devastation and human trauma, Vinnie did not hesitate in carrying out his duties. His skills and tireless devotion to duty were instrumental in restoring public safety and he proved invaluable throughout this tragic event. Hubble Keck, affectionately known as Jake, and his handler, PC Robert Crawford, were deployed to Tavistock Square, where casualties needed urgent attention after a bomb explosion on a double-decker bus. Jake immediately began a search of the street leading to the bus. Working through shattered glass and twisted metal, he secured a safe route for an explosives officer to investigate a suspect device on the bus and for paramedics to reach injured passengers. Jake also then secured an area close to the bus to enable a makeshift field hospital to treat casualties. Jake was later redeployed to search the mile-long route from Russell Square to the bomb-damaged train at Kings Cross and then to search through the wrecked train. Despite significant danger, Jake worked tirelessly and remained undaunted by the work presented to him. His skill, control and unstinting devotion to duty protected members of the public and the emergency services from harm, and his presence proved invaluable throughout this tragic event. Billy and his handler, PC Rob Brydon-Brown, were deployed to what they believed to be a train crash at Aldgate tube station. They were met by a sea of casualties and from the nature of the injuries it was clear that there had been an explosion. Billy was tasked to secure the scene by searching the length of the underground tunnel. Despite immense heat and poor visibility, Billy remained constant to his duties and did not falter. Billy remained on call throughout the day and attended 21 locations in response to alerts from the public. Working tirelessly and in the face of danger, his skills and determination to protect the public and the emergency services proved invaluable throughout this tragic event. For saving the life of two members of the crew of Royal Norwegian Navy minesweeper, Thorodd, and for his unstinting devotion to duty as ship’s mascot during WWII. In the winter of 1941, Lieutenant Commander Olav August Johan Nilsen was walking along the dockside in Dundee when he was set upon by a man wielding a knife. Bamse, who was accompanying the Lieutenant, immediately ran towards the assailant, knocking him into the water. Witnesses confirmed that it was Bamse’s decisive and effective action which saved Lieutenant Commander Nilsen’s life. On an autumn morning in 1942, Bamse was on duty aboard Thorodd, again docked in Dundee. He was the only crew member to see a sailor fall overboard and, realising the danger, he tried to alert other crew members by barking loudly. When no help arrived, Bamse overcame his fear of heights and water to dive into the cold and murky sea. He swam towards the distressed sailor, who clung to Bamse’s thick coat, and brought the man safely to the dockside. Had Bamse not acted so quickly and with such calm efficiency, the sailor, who could not swim, would have drowned. As loyal mascot of the minesweeper Thorodd Bamse displayed outstanding gallantry and devotion to the crew. His name was mentioned three times in the PDSA Allied Forces Mascot Club history and his reputation as life-saver and devoted wartime companion has secured this dog a special place in the hearts of the people of Norway and Scotland. For displaying outstanding gallantry and devotion to duty while carrying out official duties with their handler, Neil Powell, as part of the Northern Ireland Search and Rescue Dog Association (SARDA). In March 1999, Dylan saved the lives of four students lost for several hours on the mountains of Mourne. Despite exceptionally poor weather conditions, Dylan located the group stranded on a ledge 250 feet above ground level. He stayed on duty until the rescue team had lifted everyone to safety. Later, in November 1999, Dylan worked in Duzce as part of the UK Fire Service Search and Rescue team and the International Rescue Corps following the earthquake in Turkey. Dylan located two people buried alive in the rubble. Crawling between floors, climbing ladders and spanning dangerous voids, this dog never wavered from his duties. Cracker, Dylan’s brother, was also part of the 1999 Turkish earthquake search team locating bodies trapped in the debris. His ability to locate the deceased gave families the opportunity to pay their last respects to loved ones. Cracker is the only dog in the UK trained to locate bodies in water. His skills have helped locate four people, bringing closure and peace of mind to grieving families. On 18 May 2003, University student Cheryl Smith and her Golden Retriever Orca were enjoying an afternoon in the countryside. Orca was running, as he always did, alongside Cheryl’s wheelchair. Suddenly, the powered wheelchair hit a rock on the pathway and pitched Cheryl sideways down a 15-foot embankment into a water-filled ditch. The wheelchair followed, landing directly on top of Cheryl who was pinned, face-down in the cold rainwater and unable to move. Cheryl knew she was in a desperate situation. Trained to stay by Cheryl’s side, Orca remained on guard duty until Cheryl instructed him to “get help”. The first person Orca approached mistook him for a lost dog and attempted to walk him home. Breaking free of his collar, Orca ran on and, by chance, met Cheryl’s neighbour, Peter Harrison out jogging. Peter could tell Orca was trying to encourage him to follow the canal path and as he followed the dog, Peter saw Cheryl lying in the ditch. Orca took his place at Cheryl’s side as Mr Harrison called the Fire Brigade for emergency assistance. The rescue services confirmed that Orca’s remarkable skills, and unstinting devotion that day saved Cheryl’s life. On 8 March 2005, police dog Blue and his handler Police Constable David Proctor were called to assist in the search of a wooded area near Wakefield for a violent suspect wanted for theft. A short time after they started the search, officers observing from the police helicopter reported that Blue had located the suspect but had been attacked with a knife. Despite sustaining severe injuries, Blue continued to do his duty. He followed the man to his hideout and stood guard until PC Proctor and a colleague arrived. He then assisted in the disarming and arrest of the suspect, continuing his diligent surveillance until the man was placed in a police vehicle. Blue sustained two deep stab wounds in his left shoulder but never wavered from his duties. His actions resulted in the detention of an armed offender and he defused a volatile situation that could have resulted in the loss of human life. On 14 April 2005 Zoltan and his handler Police Constable Andrew Lawton were called to join the Armed Response Unit at an incident in Stockton where a man was threatening police officers and members of the public with a knife. Officers had repeatedly attempted to calm the situation and disarm the man before deploying Zoltan. The police dog’s determined efforts were very effective but resulted in Zoltan being stabbed in the chest. The distraction this created resulted in the assailant being disarmed and taken into custody. Zoltan sustained an eight-inch stab wound to his chest and underwent emergency surgery to repair two damaged arteries and a severed chest muscle. During the operation he lost one-fifth of his blood. Happily, Zoltan went on to make a full recovery and soon returned to active duty. Endal, the Canine Partner of Gulf War veteran Allen Parton, was awarded the PDSA Gold Medal in recognition of his remarkable skills, his unique companionship and the unstinting devotion to duty that saved Allen's life in so many ways. When Allen - a naval engineer - suffered brain injuries in a car accident during the Gulf War in 1991, he could not walk, was unable to speak, read, write or remember any aspect of his life. A chance introduction to Endal changed his future as Endal became the inspiration and motivation behind Allen's rehabilitation. Endal became Allen's partner in the home, on the street and at work and he rekindled Allen's enthusiasm for life. On 24 May 2001, Endal carried out one outstanding act of devotion. Allen was knocked out of his wheelchair in a hotel car park and left unconscious on the ground. Endal did not panic. Instead, he calmly manoeuvred Allen into the recovery position, covered him with a blanket from the wheelchair and pushed the mobile to Allen's face. Only when Allen regained consciousness did Endal leave his side to summon help. Monty - a Metropolitan police dog - was rewarded with a PDSA Gold Medal for Animal Gallantry and Devotion to Duty in recognition of his gallantry following an armed siege in London. Monty was instrumental in overpowering a man who had been wielding a knife and threatening his handler PC Stuart Judd. Monty was stabbed several times by his attacker but continued to do his duty. Monty required emergency surgery after the event in February 2001 but just weeks later was ready to resume active duty. Bulla - a Leicestershire police dog - was killed in the line of duty in May 1990. He was apprehending a man brandishing a butcher's knife and threatening civilians and police officers. Sadly Bulla was stabbed through the neck and into the heart. Despite all efforts to save him, Bulla died at the scene.